Two lost souls living across the street from one another yet they might never have met had Maddie Hewitson not driven her car through the front wall of Jacob Denisov's house. Suddenly, the veteran is exposed - literally - to the light. Drowning in anguish, mental torment, PTSD, and survivor's guilt, Jacob has been barely existing in his small, dark house. Now he's forced to deal with contractors, insurance agents, nosy neighbors, and "Mad Maddie," as she's been dubbed by the residents of Virtue Falls. Slowly, he's being dragged out of the darkness and back into life and he's none too happy about it. Maddie is certainly no stranger to mental anguish or to survivor's guilt either. She's been forced to live with the brutal events of her past for too long. Her move to Washington was supposed to bring a fresh start but the nightmares have followed and a killer stalks her. But it's a killer that only Maddie can see. With the front of his house gone, Jacob sits in his living room chair and watches as Maddie's madness plays out in full view. His heart recognizes her tormented soul and her fear is certainly real. It appears someone is trying to drive Maddie Hewitson over the edge. The only question is who is doing the driving? Is someone controlling Maddie's torment or has her mind finally succumbed to the horrors of her past? 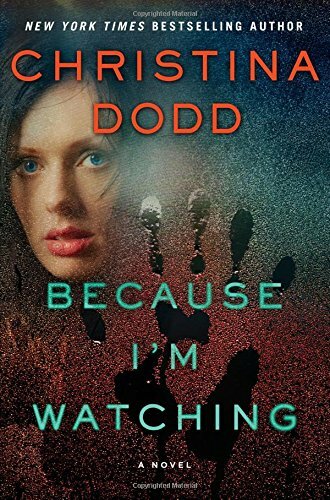 I've been reading Christina Dodd books for a long time. I began with her historical romances, followed her to contemporary romantic suspense, then to paranormal, and, most recently, her Virtue Falls suspense thrillers. While I've enjoyed her writing in all sub-genres, I believe it's with her current series that she's doing her best writing and Because I'm Watching is at the top of that list. This is the kind of book that I race through as fast as I can to find out what happens next while wanting to read as slow as I can so as not to miss a thing. Maddie and Jacob are brilliantly crafted characters, so real that even though I know they're products of Dodd's imagination, I feel sure I should have read about them in the news. I so wanted them each to find their way out of the mire and into a happy, loving, relationship together. They deserve that and so much more. The secondary cast is authentic, without a single throwaway character in the lot. Each one is well-crafted, with a purpose that affects or moves the story forward in some way. Fans of the Virtue Falls books will see some progression with a few continuing characters but readers who are new to this series will have no trouble at all reading Because I'm Watching on its own. From beginning to end, this is a story that grabs hold of the reader and refuses to let go. I read the entire book in one day. These characters absolutely would not let me walk away until I had read every single word of their journey. Dodd uses every facet of her creative mind to expertly guide her characters - and the reader - through this compelling, edge-of-your-seat, suspense thriller. Filled with compassion, intrigue, anguish, mystery, hope, murder, forgiveness, enough twists and turns to keep me constantly guessing, and a love that heals two broken souls, Because I'm Watching is a book you do not want to miss. It's one of my Best of 2016 and has my highest recommendation. Thanks for the review. I wondered how this one would be. My library doesn't have it yet. Was hoping to get it on sudio. I really think it's the best book she's ever written. Hope your library gets it soon! I enjoy her books - thanks! You're welcome, catslady. Hope you enjoy this one. I'm really looking forward to reading this one. Thanks for the post. Hope you enjoy it as much as I did, LSUReader! I have loved this series from the very beginning. It is the third book on my list to read. Hopefully I will get to it by Monday. I've only read her historical novels, but this one sounds really intriguing! I'll be checking it out. Great review!